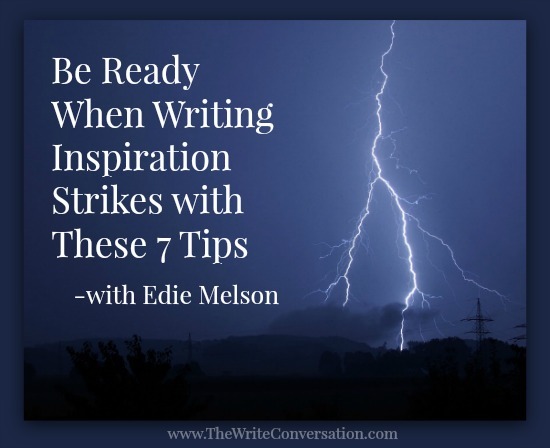 7 things to do now to be ready when writing inspiration strikes. 2. When driving, make sure you have a voice recorder within arm’s reach. My darling husband decreed note-taking off limits to me while driving—even if I was stopped at a red light. Because of that, I used to keep a digital recorder with me. Now that I have my smart phone, I use that to capture fleeting thoughts. to include notes to remind yourself why that particular piece caught your attention. There is nothing more frustrating than coming across something you thought was important with no idea why you thought it was important. Pretty comprehensive list Ms. Edie. I would be lost without my "Idealog", but I keep Post-It notes in all my vehicles. Now if I can only remember to transfer them to my "Idealog" this time. Great post! God's blessings ma'am. Very helpful Edie! I used to do this but recently have been so busy. I will keep that notebook with me. Thanks. Great ideas, thank you; I'm wondering about your spelling of elusive though. Is that an American thang. Edie, Nice ideas! You should see the inside of my gigantic purse, which goes everywhere I go in the car. In addition to snacks, it contains a variety of pens, small notebooks, and the like. And of course, my cell phone. And I have a manila folder in a file cabinet, where I keep clippings of quotes, stories, and magazine and newspaper articles, which make great fodder for articles. I hear you, Edie. I always think 'I'll remember that', only to sadly find I don't. The recorder sounds like a great idea. Great advice Edie! Though I confess, I’m a bit low on journals these days. In sheer desperation, I have a receipt from doctors care that is absolutely covered in notes or ideas. I’m slowly trying to get a system of transferring that information to one spot so that I don’t forget... I think a lot of us have a breakdown even if we do write it down. Out of sight, out of mind.